Click the picture above for details and pictures of why & how Oda and Tokugawa won most of their wars together. Saito Yoshitatsu got really mad in his dying days, because of the Oda-Tokugawa alliance. Click here for the details and pictures of the Sunomata war of Oda Nobunaga against Saito clan. Meanwhile, Oda Nobunaga's scheming brother in-law, Lord Saito Yoshitatsu, died of something that might be said of as leper. His heir, and thus the next chief of the Saito clan, Saito Tatsuoki, was only 13 years old, but this kid was already a veteran when it came to women and alcolholic substances. His late-night parties were notorious, and during his short reign he practically had always been in a hangover. This made Oda to decide 'now or never' about the fate of the Saito realm. A significant year, for this was the one when Oda Nobunaga sealed an alliance with Tokugawa Ieyasu. It was Oda Nobunaga's idea, and Tokugawa turned out to have been having the same thought about their dads' useless routine small-scaled skirmishes around the Owari-Mikawa borders (click here to know what Oda Nobunaga actually wrote to Tokugawa when proposing the alliance). They tried to keep it as a hush-hush biz for a while, though news like this surely leaked. Tokugawa had all the reasons to conduct the hushing up; his wife and son were held hostage by Imagawa Ujizane, the new Lord of Suruga, who obviously copied faithfully his dad's way of powergaming (this clan seemed to have really loved taking hostages, like the Takedas of Kai). The hostage situation went on until after Tokugawa got his own hostages, and a barter was forced on Imagawa. After that, his alliance with Oda was okay to be known throughout Japan. But it wasn't an earthquaking news, you know. Oda, 27 years old, and even more so Tokugawa, 18 years old, was seen as an apprentice in the business of warlording the country. They, in a universally 'Asian' way of seeing, were 'immature'. Older people than they hadn't yet succeeded, or got a chance to, so how could they? Besides, everyone predicted a major fallout soon because Oda's personality was exactly the opposite of Tokugawa's (click here for why it worked very very well instead, for the same reasons). And the rest were totally skeptical because the real great warlords of the year -- Takeda Shingen of Kai, Uesugi Kenshin of Echigo, Mori Motonari of Kai -- were all major shareholders in the dreamed-of 'Japan, Inc.' of Oda Nobunaga's. How could he, even in a duet with Tokugawa, pave the way that wasn't even his to begin with? In the first years of their alliance, while Oda Nobunaga was warring, Tokugawa himself was mostly busy overhauling and mending the long-neglected province of Mikawa, and slowly building the finest army that other warlords could only dream of. Including Oda Nobunaga. Meanwhile, the 25 years-old Toyotomi Hideyoshi got married. His wife was a low-ranked archer's daughter, named Asano Nene. According to rumors, Nene used to be Maeda Toshiie's girlfriend, and if we are to believe Toyotomi's biographers, they were even already engaged -- only Nene changed her mind and chose Toyotomi instead. The boost to women's rights sounds too 20th century to be authentically 16th, but there's no way we could verify such a thing now. Oda Nobunaga (standing with a sword) watching construxion workers building the Komaki castle. 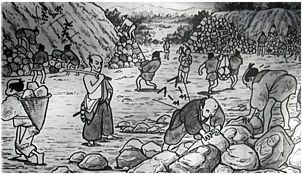 The average rate of construxion work in 1570's in Japan was around 3 years per castle -- a lot of castles didn't have any stone-mine close by, or woods, or clay. Oda Nobunaga, of course, wouldn't have had any patience to wait that long. His most colossal architectural stuff, Azuchi, was to get finished in 3 years. To workers at the Komaki hill he gave a deadline of 6 months. Click here for pictures of the Komaki castle. After Oda Nobunaga's 29th birthday, the Oda HQ was moved to the newly-built Komaki castle for strategic reasons: it was much more convenient than Kiyosu to march a large joint-army from, it had a better water supply, and it was closer to the province he coveted. Oda Nobunaga, then, was militarily preparing to take over the Saito province of Mino. This made battles against that clan a new routine. A crucial being in the campaign was Toyotomi Hideyoshi, who was by now a 27 years-old Captain and on his unbelievably speedy promotion to be a General. For the first time, Oda Nobunaga saw validation of what he had somehow already sensed when he took the man from the street: Toyotomi's 'secret power' in warfare. Everyone knew the man was not a soldier (and never would be all his life); he never mastered martial arts and swordsmanship to the level that equals his official rank in the Oda Army. Any Sergeant -- no, any freshly-conscripted private -- could beat him easily in a duel with whichever weapon. But Toyotomi never said 'impossible', and he was a past master in persuasion so that instead of being attacked by or alternately cutting the heads of Saito vassals Oda Nobunaga got them one by one to his side -- via Toyotomi. Click here for story and pictures of Asai Nagamasa, Lady Oichi, her next marriage, and so on. The Asai clan of Omi wanted to take the same Saito territory, too. In order to make peace with them, Oda Nobunaga gave her 13 years-old sister Lady Oda Oichi away to be Lord Asai Nagamasa's wife. The marriage, despite the why, worked surprisingly very well. Oda himself found that he personally liked Asai. Whenever he got time, he invited Asai to Kyoto and showed him around, treating him like he never even did his own brothers. Oda Nobunaga's adopted daughter, 13 years old, was married to Lord Takeda Katsuyori of Kai, 19 years old, son of the powerful warlord Takeda Shingen, for the same reason as Lady Oda Oichi's marriage previously. Still in the same year, Oda's own daughter was married to Tokugawa Ieyasu's son Nobuyasu. Both the bride and the groom were conveniently facilitating political nuptials; they were still 8 years old. In a petition to the Emperor, Tokugawa Ieyasu asked to be let to use that name from this year on (sorry, I always hate this sort of practice -- he previously known as 'Matsudaira Motoyasu'). Oda Nobunaga, at the time, started to capture Saito's outlaying castles. Oda Nobunaga's seal contained the slogan "One Realm Under One Sword". Click the picture above for story and pictures of how Oda Nobunaga managed his conquests and aftermath of victories. Click here for photograph of the authentic Oda Nobunaga's seal. Traditional house of Gifu in winter. Oda Nobunaga's private chamber was here in 1568 in Gifu; today what remains is just some neat ruins. 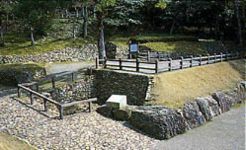 Click the picture for pix of Oda Nobunaga's hangout places at Gifu. Click here for Oda Nobunaga's Favorite Retreat in Gifu: Sofuku Temple. 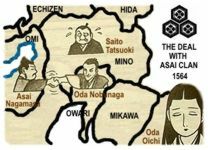 With a tremendous help from Toyotomi Hideyoshi who planned some cutting-edge tactics (click here for one of the magic trix of Toyotomi's in this campaign), the province of Mino fell into Oda's hands, and he also got another son, named Oda Hidekatsu. This son was adopted by Toyotomi Hideyoshi. Such a thing, to a vassal, was some kind of a reward and emblem of his status in the eyes of his colleagues. So it got Toyotomi some fresh secret haters within the Oda HQ. Plus he got a grandson from Takeda Katsuyori, Takeda Nobukatsu. But his 18 years-old adopted daughter died when delivering this kid into the warring planet. Since then, Oda's relationship with the Takedas retrogressed. But, no matter what, this was the year Oda Nobunaga's slogan (he even got it engraved on his seal) "One realm under one sword", or kind of 'Japan, Inc.' politically speaking (in Japanese the slogan reads 'Tenka Fubu') was coined and gained currency. It's not just a whim; Asians are forever sensitive to symbolism. From now on, anybody receiving a letter sent by Oda Nobunaga would automatically get an announcement of his intention about the country as a whole -- that he wanted to make it a whole, to begin with. If you were a warlord nurturing a similar ambition, or you were not that sort of dreamer and yet you didn't exactly love Oda Nobunaga in the first place, it would have looked like a challenge to combat, and you had to decide to be in his way or join him. Tokugawa Ieyasu had been Oda's ally for six years now, and Toyotomi Hideyoshi was busy supervising things around the Oda castle, and both took the 'Tenka Fubu' thing as a sign that they had been working with (in Toyotomi's case, 'for') the right man. Oda Nobunaga, by officially inaugurating in full view his nationwide campaign, had given the Tokugawa clan a direction they were most eager to go through. Some amateur historians wrote in several sites that the 'going public' of 'Tenka Fubu' meant Oda Nobunaga wanted to be Great General ('Shogun'). Some others said he wanted to kill the Emperor and become one himself. Both are equally preposterous assumptions. Oda Nobunaga, of all people, knew for a fact that he, as a descendant of the Taira clan, could never, ever, become a Shogun (click here for story and pictures why so). It's not a law, but it was a convention -- no one ever broke it anyway for a thousand years. Oda never wanted to be Shogun. He only wanted to rule the country. The first thing means an exact kind of ruling and an official title. The second was free for him to define. As for deposing Emperors, that kind of thought is so cluelessly caucasian. No 16th century warlord wanted to be Emperor. No sane Japanese ever did, for that matter, any time at all; whenever something close to such happened (as in Taira Masakado's rebellion of 10th century), the ones trying it already knew it would never work, nonetheless they tried it before the inevitable downfall and sure death. Whenever there were two Emperors at the same time such as at the Gempei War (Minamoto versus Taira clans), both got the right DNA to sustain the claim. Only the one who got more soldiers and better Generals usually won the monopoly of the title in the end. That someone wanted to be Emperor without being born as such was totally unthinkable in a society that grew within the belief of divinity of their monarchs. Oda Nobunaga knew this, too, and although he could produce every proof of being obsessive (like, when it came to horses and tea utensils), he was never certifiedly insane. Oda Nobunaga and Ashikaga Yoshiaki started the biz with a mutually beneficial alliance, although it would have sent Tokugawa Ieyasu to tragic laments if he were to take Oda's place in financial terms. Oda Nobunaga had to pay for everything that Ashikaga and all his family and followers ate, wore, consume, lived in, and senselessly given away. In return, the Oda clan got the position as the Imperial Army, which means Oda's status was equal to a Shogun. That mutual symbiosis was a tick-tocking bomb precisely because of its benefits. Ashikaga was a ridiculous daydreamer and really believed in the empty shell of a shogunate that he didn't even get by inheritance. He ended up feeling that Oda Nobunaga had trespassed his authority -- an authority that he never even had, to start with. While Oda of course felt like getting snubbed after everything he had done for (himself as well as ) the crybaby Shogun, and got pissed because Ashikaga couldn't see the truth of who's the power now. The people of Kyoto and the surrounding area reading Oda Nobunaga's announcement of the abolition of toll booths. While this was the first time Oda Nobunaga (34 years old) marched side by side literally with Tokugawa Ieyasu (25 years old) to war (Tokugawa couldn't join him in person before, until his internal restructuring of the army was over), there was also a domestic biz that meant a lot: Oda changed the name of the Saito's capital from 'Mount Inaba' ('Inabayama' in Japanese) to 'Gifu' (click here for pictures). From here on, his star steadily pointed towards Kyoto in a way that Imagawa Yoshimoto never even dreamed of in life. Meanwhile, Shogun Ashikaga Yoshiteru was murdered. His brother Ashikaga Yoshiaki wanted to be the successor, but he had nothing to start working toward it with. So he asked Oda Nobunaga for help. Oda marched to Kyoto as if he was only going shopping (in Ginza, that is); crushing the clans of Rokkaku, Miyoshi, and Matsunaga along the way -- the last two were the Shogun's enemies, and the first was for putting up literal roadblox on Oda's way. Oda's priority after installing Ashikaga at a palace that he built for that purpose (Nijo) was to overhaul the law and other such annoyance in and around Kyoto. One of these was the abolition of toll booths that used to plague average travelers to and from the capital city; many people couldn't afford the fee to use the roads where toll booths stood. Oda Nobunaga went to Kyoto undercovered once, in late 1560's; being an 'average' traveler himself at the time, he could experience the thing firsthand and didn't like that way of extracting tax. This was a very popular measure and the people loved it. At the same year, Nobunaga's 10 years-old third son Oda Nobutaka was married to Lady Kambei of Ise as a preliminary step to conquer this much-coveted territory (click here for story and pictures of Oda Nobunaga's kids). Since the Kambeis didn't have an heir, Oda Nobutaka got the title as Chief of this clan. Defeating the clans of Ikeda, Takatsuki, and Ibaraki in Settsu Province. Nobunaga's 11 years-old second son Oda Nobuo was adopted by the Kitabatake clan who lost the war. Nobuo was to be the Chief of the clan, too, plus he was married to a Kitabatake daughter. Nobunaga’s younger brother Oda Nobukane was also adopted, by the Nagano clan. In Kyoto, Oda Nobunaga was busy around the issue of Catholic missionaries this year after his 35th birthday. A V.I.P Nichiren Buddhist priest somehow convinced the Emperor to order execution of Catholic preachers, and to outlaw the religion in all Japanese spots. Oda got there in time to cancel the decree. Like I said everywhere else, Oda Nobunaga was not interested in Roman Catholicism, and the feel-good statements of Portuguese missionaries that Oda was about to get converted was true-blue bull. He was merely tolerant towards Catholic missions; he always got happy about imported stuff from the 'barbarian' lands. His so-called 'sympathy' toward Roman Catholicism was the same as his sympathy for sponge cakes and red wine. Plus he had other things in mind; to 'use' the missionaries whenever necessary (click here for story and pictures.). Especially to piss off his domestic enemies, the constantly troublemaking Buddhist warrior-monks. The only thing that is factual is that Oda Nobunaga was the most friendly of the three so-called 'unifiers of Japan' when it comes to expatriates. Toyotomi Hideyoshi wasn't so nice to them, while Tokugawa Ieyasu and his entire dynasty were downright hostile. Click here for history, pictures, profiles and map of Christian samurai, warlords and rebels of Japan in 16th-17th century, and how Oda Nobunaga, Toyotomi Hideyoshi and Tokugawa Ieyasu differently dealt with them. Click here for story & pictures of the bloodlusty warrior-monks. Ashikaga Yoshiaki got his shogunate in Kyoto as firmly replanted as he wished, thanks to Oda Nobunaga who fought for him and fed him and built palaces for him and so forth. This Shogun was a pain in the neck for real, but that time Oda didn't have time to think about him. He was busy far away from Kyoto, though this was related to Ashikaga's interests, too. It started with the convention of the time, that the Shogun had the right to ask warlords -- only those who acknowledged his authority and whose territory was easy to reach -- to come to Kyoto and stay there awhile as a show of loyalty. Lord Asakura Yoshikage of Echizen refused to do this, because he knew the real authority in Kyoto was Oda Nobunaga, and he wouldn't care to pay such a homage to fellow-warlord. So, getting this flat-out rejection, Oda fetched his men and marched to Asakura's realm. Tokugawa Ieyasu was with him in this expedition. But he kept his brother in-law Lord Asai Nagamasa of Omi -- a former ally of the Asakura clan -- utterly in the dark. Shocked by Oda's attack of the Asakuras, Asai broke his former loyalty to Oda Nobunaga, and fought him instead, to help the Asakuras. The two clans united with Oda Nobunaga's fiercest enemies, the warrior-monks of Mt. Hiei. The battle is remembered today as the Anegawa war (click here for story and pictures of the ugly personal stuff that happened because of this war). Oda Nobunaga's brother, Oda Nobuharu, was killed there; so was Mori Ranmaru's father, Mori Yoshinari. On the other hand, the Anegawa episode in the history of the Oda clan was crucial for Toyotomi Hideyoshi. He was, here, given the prestigious battle-fan (that meant he was the Chief of Staff) by Oda Nobunaga. Click here for details and pictures of the battle of Ane River ('Anegawa' in Japanese) between Oda Nobunaga and Tokugawa Ieyasu versus the Asai and Asakura clans.